We tested the Vernee V2 Pro “rugged” smartphone, whose main objective is to provide a super-resistant Android phone that can be used in any environment. With the V2, therefore, we are not faced with a model that is chasing the highest possible performance. It’s also very different from a “normal” smartphone aesthetically. The model has features that place it in a particular class, such as the Android operating system: Oreo (where most rugged smartphones are with Nougat). PROCESSOR Mediatek Helio P23 (MTK6763), Octa-core 12.0GHz. CONNECTIVITY Wi-Fi 802.11 a/b/g/n/ac, dual-band, 3G, 4G, Bluetooth 4.0, GPS. The Vernee V2 Pro is presented in a decidedly premium package for a rugged phone. The box is made of white cardboard and is very minimalist – with just the Vernee logo on the front. Although the Vernee V2 Pro is a rugged phone, and therefore built to withstand pretty much anything, it does not resemble other robust smartphones on the market (see models like the Snopow M10, the Caterpillar CAT S30 or the Snopow M5). The design not only offers the maximum possible strength, it is also nice to look at. 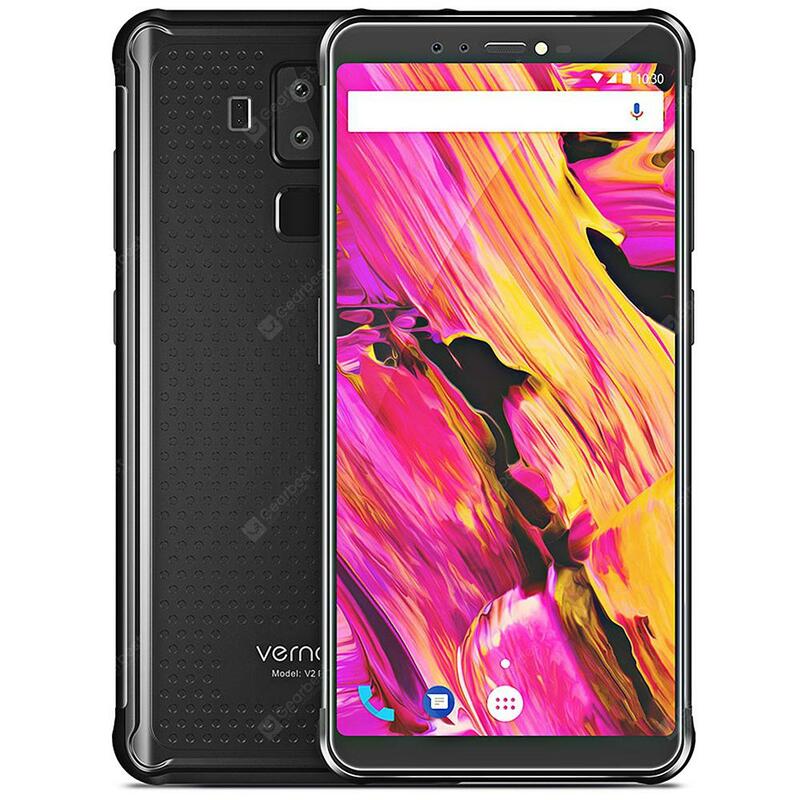 It must be said that the Vernee V2 Pro is a LARGE smartphone (its thickness reaches 12.1 mm) and it’s heavy (259 grams). You can put it in your trouser pocket, but it’s definitely not one of the thin smartphones we’re used to. But that is not the point. The V2 Pro is produced for those who work in the field, and for those looking for something more than a robust cover or a certain resistance to water. A phone that can survive falls, scratches, dust, water and extreme conditions. The side keys are protected and finished in plastic; the only negative is that it might be difficult to press them with gloves on, because they are not very large. On the right side, you find the volume and the power buttons. On the left side, there is a special button to activate the battery saving function and the slot for the 2 SIM cards. On the back, the Vernee V2 Pro has a dual camera sensor, flanked by the flash and fingerprint reader. The sensor for heart rate detection is very interesting, positioned right next to the camera. At any time, just place your finger on the sensor to receive information on your heart rate. The V2 Pro is available in two colours: completely black (like ours), or black with red trim on the sides. The Vernee V2 Pro has an IP68 certification, which provides dust and water resistance (up to 30 minutes and 1.5 meters). 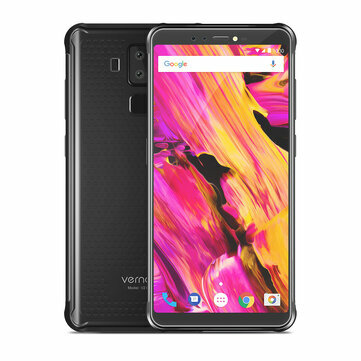 Furthermore, it can also work at extreme temperatures: from -30 ° C to 60 ° C.
The Vernee V2 Pro features a 5.99-inch Full HD Plus display with an aspect ratio of 18:9, a resolution of 2160 x 1080 and a density of 403 pixels per inch. The display is slightly curved along the edges, and the Corning Gorilla glass protects it from scratches or sudden bumps. Vernee have also managed to significantly reduce the side edges of the screen, and the top and bottom bezels, with an 81.3% phone display to body ratio. The colours are excellent and the brightness is particularly powerful, even if outside in direct sunlight it is not very clear. But overall, it’s a really good display for this particular model. The Vernee V2 Pro has a MediaTek Helio P23 (MTK6763) processor and 6 GB of RAM – more than enough for multitasking. The storage space is 64 GB (expandable up to 128 GB with an SD Card), of which 10 GB is system memory. The memory that can actually be used is therefore about 50 GB. In the graphics department, we have a Mali-G71 MP2 GPUs at 770MHz. The Vernee V2 Pro works on Android 8.1 Oreo with VOS UI. In addition to the Google package and standard apps like YouTube and Facebook, there are some pre-installed apps (eg DuraSpeed) that we recommend you uninstall because they continue to work in the background and send annoying notifications. If you’re looking for a phone that takes great pictures, the Vernee V2 Pro is not for you. Despite having 4 cameras (Dual rear and front cameras), the quality of the photos is acceptable only during the day or with sufficient lighting. If there is little light however, the noise is quite evident; and this is to be expected really, because this model is not designed to take excellent shots, but to be resistant. The front camera is also doubled: 8MP (SW 13MP) + 5.0MP. The video recording is not bad. In fact, the results are slightly better than expected considering that the Vernee V2 Pro does not have a stabiliser. 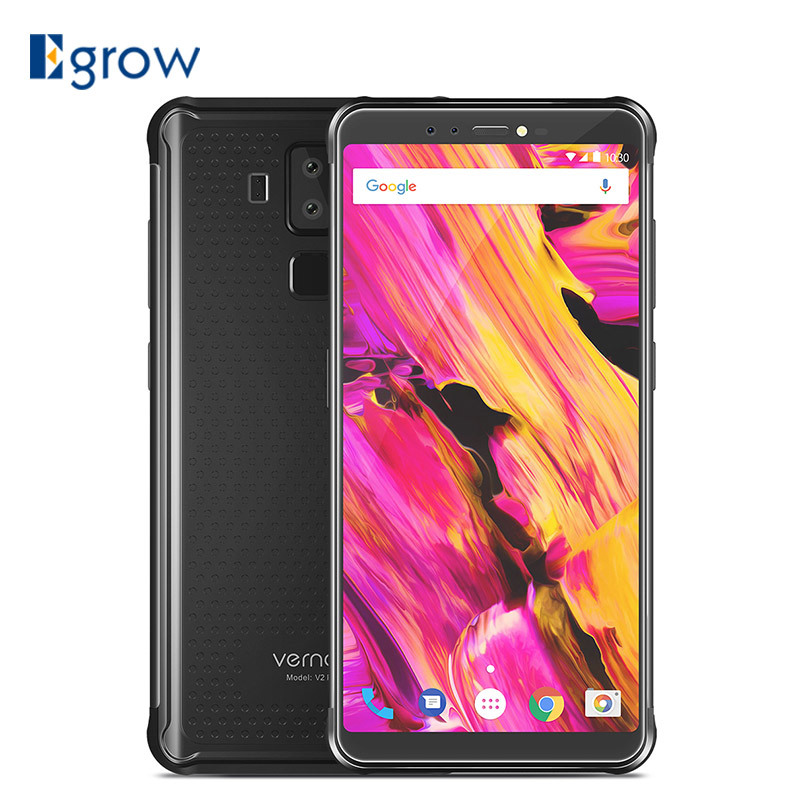 Being a smartphone designed to withstand, the Vernee V2 Pro is equipped with a large 6200 mAh battery (9V / 2A non-removable) that certainly does a good job. It lasts for more than 15 hours in video mode and, when used normally it can work for more than 25 hours without any need for recharging. Once plugged in, the battery takes about 2.5 hours to fully recharge thanks to the fast charging. We also advise you to make the purchase through PayPal, which guarantees a full refund in case of non-delivery of the goods or a defective / non-compliant product.